When you are craving chocolate, there are many things that you dream about. Brownies have been the perfect chocolatey treat for over one hundred years. That many years of brownie lovers cannot be wrong. The invention of the microwave brought on the popular brownie known as the brownie in a mug. It is so easy to have a yummy, warm, fudgy brownie when that chocolate craving hits. Mix the dry ingredients in a microwave safe mug. Be sure that you break up all the chunks. Add in the water, oil, and vanilla. Mix well, until it is smooth. Place the mug in the microwave. Heat until the brownie is cooked through. The cooking time will depend on your microwave; a 1000 watt microwave will cook the brownie in about 1 minute and 40 seconds. If you are unsure of your microwave’s power level, begin with 60 seconds. After 60 seconds test the brownie, it should be moist and not dry when done. Cool the brownie for a couple minutes before serving. Then serve while it is still warm with a scoop of ice cream or whipped topping. Most mug brownie recipes use the same steps for creating the perfect brownie in a mug. You mix the dry ingredients, then add the wet ingredients, mix well, then cook in the microwave until done. 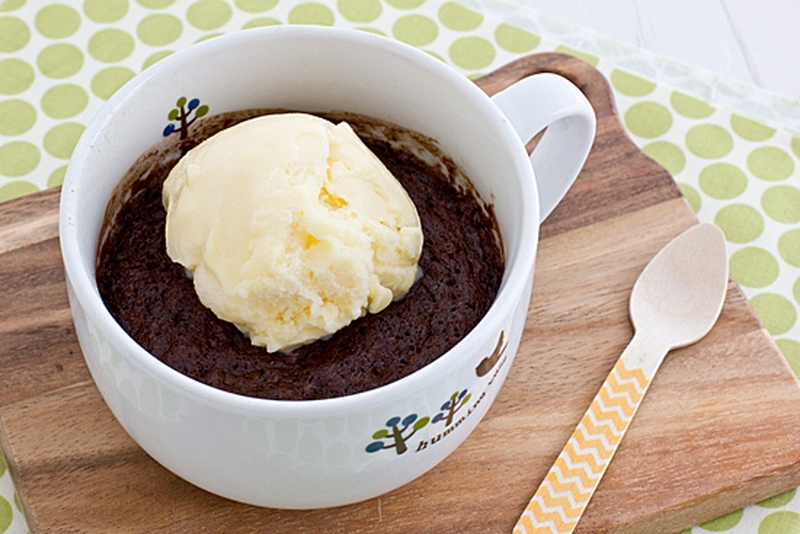 The fun of a brownie in a mug comes when you get creative with the recipe’s ingredients. Now that you have the basic recipe for creating a delicious single serve brownie, that will beat any chocolate craving, it is time to explore your creativity. Using any of your favorite ingredients, ones from the samples listed below, try to make your special go-to mug brownie. Remember once you choose your ingredients, first you mix the dry ingredients and then add in the wet ingredients. There is nothing better than an ooey gooey brownie to satisfy your sweet tooth. Experiment with the recipes above or create your own. Which is your favorite brownie in a mug? Share in the comments below. If you created your own, share that recipe too because it will help someone else have an extra chocolatey day.